We’d enjoyed our mid winter UV dose so much last year that we decided we ought to do it again. Wanting somewhere with a good chance of sunshine (more on that later) we’d settled on one of the Canary Islands. Not really wanting to stay in the main tourist areas I’d scoured the internet and found the perfect place and we were set. Arrived to sunshine, picked up the rental car, pottered round the island until we were ready to go to Chirche, our destination for the week. Worries that the car wouldn’t make it up the steep inclines were unfounded and we reached our destination which surpassed all expectations, the view from the roof terrace (see above) was amazing. More grey skies with rain threatening, but it looked marginally better to the west so that’s where we headed. 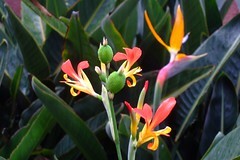 A pleasant stop at the Botanic gardens, the sun even managed to put in an appearance. Ended up finding ourselves not far from the capital, so decided it was worth a stop to get permits to go up to the crater of Teide later in the week. With minutes to spare we managed to find a shop to make photocopies of our passports and got the permits we wanted. A stop for an lunch and then time to head back down the coast. And it was still raining. Traffic was slow coming out of the city and it soon became obvious why, huge volumes of muddy water were gushing over the concrete embankments bringing with them rocks which littered the carriageway. We slowly picked our way home, dodging the rocks and the landslides and ‘admiring’ the newly formed waterfalls. Arriving back to Chirche, it seemed the whole village was out looking over the Barranco, now a raging torrent where previously there’d been just a trickle of water. Finally back to the cottage, pop to the toilet as you do, and no lights, further investigation reveals an inch of water on the bathroom floor. Canarian cottages just aren’t built for the sort of onslaught of rain. Water running in where the roof met the wall had run over a light socket and tripped the switch. Nothing to do but wait for it all to dry out. So woodburner on and table lamps only but it made for a cozy feel. Another night of rain, but it had gone by the morning. Just a day of pottering about. 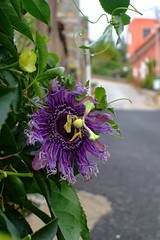 A short walk to explore the village and around, the barranco much reduced from the day before. Orange groves and almond trees and the rain all combined to produce a great scent. Sunshine, finally what we’d come for. 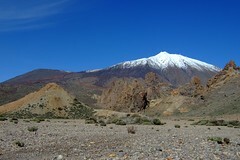 As the morning mist cleared, we glimpsed the top of Teide for the first time, blanketed in a fresh covering of snow. Heading up to the interior, gradually the trees get thinner, until you emerge into a lunar landscape. The area we were walking in was the result of a volcanic eruption in the early 20th century, barren but beautiful in it’s own way, especially against a backdrop of beautiful blue skies and the white topped Teide. Lots of interesting bits of petrified wood, huge lumps of rock that were mostly air allowing us to pretend to perform great feats of strength and of course the obligatory rock balance. This was more like what a holiday was supposed to be. The day was topped off with a great sunset and great food at the Mirador de Chirche. 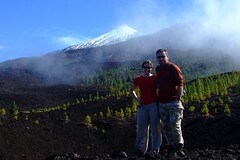 The day we had our permits to go up Teide had arrived, but unfortunately not the chance to use them. The cable car was closed because of the snow and huge rockfalls from the floods had closed the main route into the park from the south, spoiling any chance of being able to hike up from the road. It seemed like there’d be stuff to see though, even without the trip to the top, so we decided to make the long trip up the west coast, past the Drago Tree at Icod (another car testing hill here!) and into the national park that way. Los Roques De Garcia was our destination, cool rock formations that once formed an ancient volcanic crater wall. After 5 minutes walking we were away from the crowds, admiring the walls of rock. Walking back up the closed road back to the car we were somewhat pleased to find car sized lumps of rock blocking the road, not just a bit of rubble so the 3 hour detour was justified. On the way home we discovered that the road up to a village where the start of a hike we wanted to do along a barranco was closed, so our minds were made up, whale watching was on. 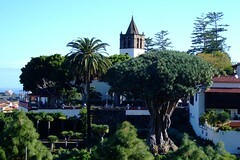 Brilliant sunshine in the morning and a view of La Palma and La Gomera from the terrace. 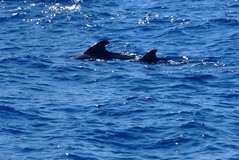 Just the day for whale watching, we popped down to Playa de las Americas and booked our spot on the boat. A spot of lunch before we set sail, and we soon found a pod of pilot whales in the channel between the islands. Amazing how quickly an hour or so goes when you’re just waiting for the next appearance. Running out of holiday but wanting to make use of the snorkel gear we brought from the UK we took a trip down to the coast to Alcalá. We’d been told by the owners of the cottage we were staying in that it was possible to see turtles there. No beach, but a terrace and stone steps over the rock straight into the water. Surprisingly warm. 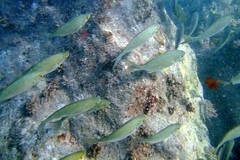 The rains earlier in the week meant visibility wasn’t great, but still hundreds of fishes to see. A very pleasant way to end a holiday.